The CfCP offered a three-day intensive short course on cosmology for college faculty. The course was designed to revitalize undergraduate curricula by communicating the latest advances in cosmological research to classroom teachers. The course drew upon the experimental and theoretical strengths of the center and the CfCP's appreciation of their interplay in modern cosmology. This course was a resounding success (see evaluations). Center members offered participants a solid background and insights into the latest advances in research. 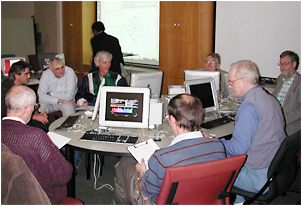 Laboratory sessions provided hands-on experiences with leading edge technology (e.g., detecting the cosmic microwave background, CMB) and practical exercises (e.g., use of the web-based Sloan Digital Sky Server, SDSS). Field trips to Fermi National Laboratory and the Adler Planetarium provided additional dimensions to the course (e.g., science on a grand scale and public communication). Our collaborators - the Chautauqua Organization, Adler Planetarium and Astronomy Museum, Fermi National Accelerator Laboratory, and CARA - enriched the short-course through their involvement and with the leveraged resources they provided. The 35 participants were primarily faculty from non-research undergraduate institutions but included three local high school teachers and three staff members from the American Museum of Natural History who are working on a cosmology exhibit. Course evaluations indicated that The New Cosmology reinvigorated the faculty and gave them practical tools to bring the discoveries at the frontiers of physics back into their classrooms. The inaugural workshop sponsored by the Center for Cosmological Physics was devoted to addressing the efficacy of various cosmological probes of dark energy, including SNeIa, weak and strong gravitational lensing, galaxy and cluster counts, CMB anisotropy, and the Alcock-Paczynski test. The workshop brought together experts to study and discuss the important details and systematics associated with these cosmological probes as well as new ideas or strategies. The afternoon before the workshop, Edward Witten gave a highly successful public Colloquium which put the dark energy problem in a larger context of fundamental physics. The Yerkes Winter Institute is a three-day immersion program that allows students to explore one topic in depth. This year the topic was Sound, which built upon the autumnal laboratory investigations. The students rotated among three interconnected daytime experiments, made nighttime observations, and shared their investigations with parents, siblings and younger students who joined us at the end of the institute. The Yerkes environment provides a great contrast to the urban environment of Chicago. 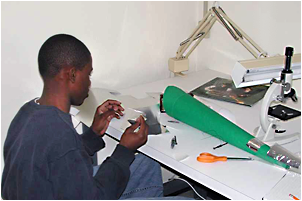 The institute is also a learning experience for the instructors. For example, by pairing classroom teachers with researchers, each partner can learn from the other's complementary skills.